Hot Yoga is a sequence of yoga postures performed in a heated environment. The increased temperature in the room allows an increase in stretching and flexibility and helps to prevent & heal injury. It is a detoxifying practice with a variety of health benefits. Drinking plenty of fluid before and after class is necessary. Symptom relief for the following: sciatica, high blood pressure, arthritis, neck and back pain, diabetes, herniated disc, scoliosis, insomnia, stress, migraines, depression and anxiety. AT WHAT TEMPERATURE IS HOT YOGA PERFORMED? 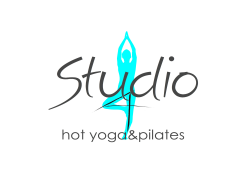 WHAT DO I NEED TO BRING TO A HOT YOGA CLASS? You will need to bring a yoga mat and a large towel to cover your entire mat. If you don’t have these things we rent them at the studio. Water is a MUST. Wear very lightweight exercise clothing. Try to avoid cotton. You may want to bring a change of clothes for after class. You can count on getting sweaty. We recommend that you don’t eat anything heavy for at least 2 hours before your class. However a light snack or smoothie before class usually does not bother students. Everybody is different and you will figure this out the more you practice. Yes! Drink plenty of water before and after your class. Some students add electrolytes or trace minerals to water to help replenish what your body will sweat out. Coconut water is also a great idea to consume after a class – this is wonderful for re-hydration and has more potassium than bananas! A natural alternative to sugary sports drinks. Everyone has to start somewhere! Many new students have no prior experience with yoga at all. Our classes for everyone and our teachers can help you modify postures to keep you safe. Hot Yoga is therapeutic. Healing requires increased circulation to the injured area and increased circulation results from movement. However, always be aware of alignment and listen carefully to the instructions as they pertain to placement of the feet. Never compromise form for depth, and just go as deep as you can into postures to allow for healing and improved strength. Many people think that they need to be flexible to do yoga, but that’s like saying you need to be strong to lift weights -just as you become stronger by lifting weights, you’ll start to gain flexibility by doing yoga. This is especially true of hot yoga – because your muscles are warm, then your body will be more open and pliable and you’ll find that you can stretch more deeply than you can at room temperature. Yoga is a lifelong practice that requires commitment and dedication. For new students, consistent and daily practice is recommended for the first few weeks, and preferably first few months, in order to allow your body and mind to acclimate to the heat and the changes resulting in your body. Consistent and daily practice up front will help your body acquire the physical memory and stamina necessary for enhancing your practice every time you are in the room. After you have established a solid foundation for your practice, at least 3 times a week is recommended for continued improvement. Any yoga practice is beneficial. Come as often as you can. Yes! Hot Yoga will benefit your life in all areas and give you more energy! It will also help to prevent injuries associated with other physical activities you may participate in. For two main reasons – the heat gives you access to many physiological and psychological benefits. In other words, it’s good for your body and your mind. Namaste means “The light in me honors the light in you.” There are many translations. Simply put, it is a sign of respect from one person to another.